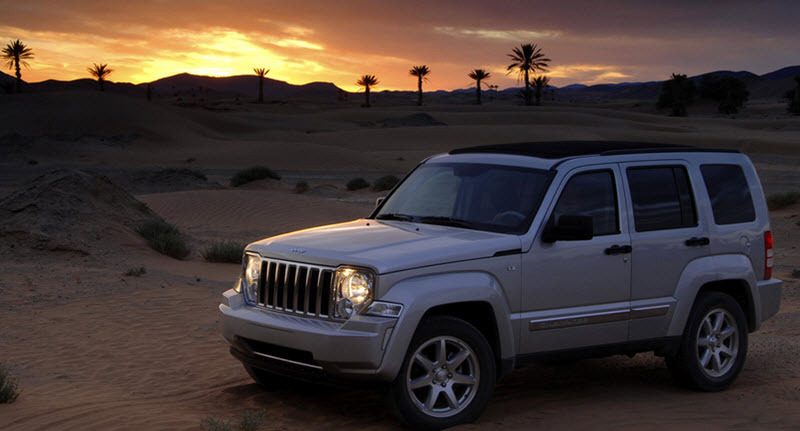 The Jeep Cherokee (KL) is a mid-size crossover SUV manufactured and marketed by Jeep. It was introduced for the model year 2014 and sales began in November 2013. This is the first Jeep ever to use the Fiat Compact/Compact Wide platform. 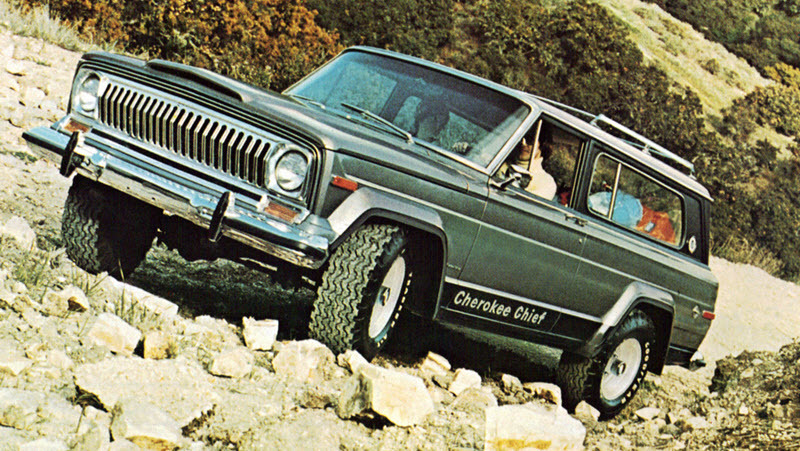 The wheelbase is 106 inches, which is 5.1 inches more than for the Jeep Cherokee XJ. The choice between three different 4WD-systems: Active Drive I, Active Drive II and Active Drive Lock. All three come with Selec-Terrain traction control and rear-axle disconnect feature. The rear axle disconnect is a new feature for compact SUVs. SportThis was the base trim for the new Cherokee KL, and available for both 4WD vehicles and 2WD vehicles. Among other things, it included 17 inch steel wheels, cloth seating surfaces, the 2.4L Tigershark I4 engine, 9-speed automatic transmission from ZF, Unconnect 5.0 touch screen radio, and six speakers. In 2015, the 3.2L Pentastar V6 engine was made available as well. With the Latitude trim, you got stuff such as alloy wheels, body-colored door handles and body-colored side view mirrors. Latitude was available for both 4WD vehicles and 2WD vehicles. In Canada, the Latitude was sold as North 4×2 or North 4×4. 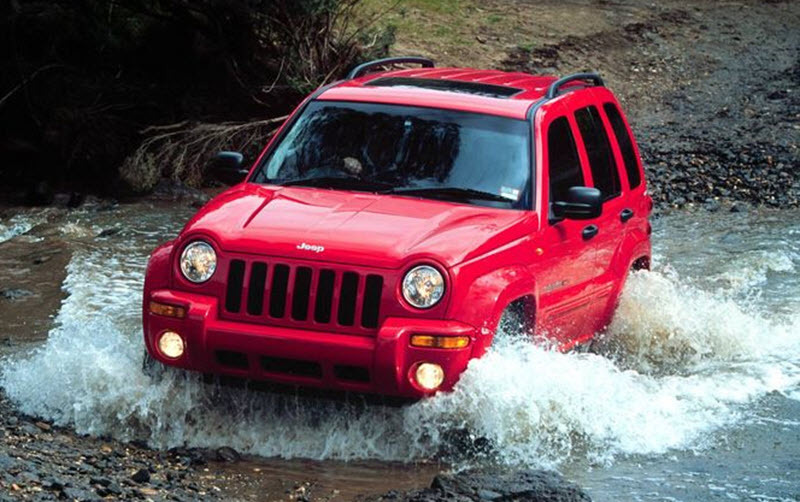 Trailhawk was only available as 4WD and promoted as a superior offroading choice. It did for instance have recovery hooks (for dragging out a stuck vehicle) and a mechanical rear locker. It also came with extra comforts such as the Unconnect 8.4A touch screen radio with 9-1-1 emergency assistance, roadside assistance, and support for apps. The wheels were dark-colored alloy ones. This was the most expensive trim, and gave you luxuries such as leather seating surfaces, heated dual front seats, Keyless Go with push-button and remote starter systems, and the U Connect ACCESS 8.4A touch-screen infotainment system. The wheels were brigth-finished alloy ones. Limited was available for both 4WD and 2WD vehicles. This trim was created to celebrate Jeep’s 75th Anniversery. It was based on the Latitude trim, but with many special changes and additions, such as deep tinted glass, a full panoramic power moonroof, automatic front head and fog lamps, premium cloth seating surfaces with Ombre mesh inserts, 75th Anniversary Edition embroidery on seating surfaces, bronze-accented interior details, 75th Anniversary Edition exterior emblems, bronze-painted exterior accents, abd bronze-painted 18 inch alloy wheels. Also, the 75th Anniversary Edition came with the U Connect ACCESS 8.4A infotainment system. In late summer 2013, an issue with the transmission software caused Jeep to temporarily cease production of its new Jeep Cherokee. The few thousand vehicles that had already been produced with the faulty software were kept at the factory until the issue was fixed in October. This was also when production resumed. Both the 2014 and 2015 model year recieved an unusually high number of complaints related to the transmission. The KL was the first vehicle to market to use the new 9-speed automatic transaxle from ZF. Multiple vehicles fitted with this transmission suffered from similar problems, including the Honda Pilot, Acura TLX, Range Rover Evoque, Chrysler 200 and Jeep Renegade. Chrysler released several software updates for the 2014-2015 Cherokee transmission, insisting that the issues were software related. The issues delayed the release of the 2014 Jeep Cherokee KL until late summer 2014. In 2016, ZF issued a recall regarding its 9-speed automatic transmission, suggesting the issues were related to a faulty control sensor which could make the transmission drop into neutral while the car was being driven. The recall affected well over half a million vehicles. The Jeep Cherokee KL was introduced to the European market in spring 2014. In July 2015, FCA recalled 1.4 milllion vehicles due to a software glitch that made them volnurable to wireless hacking and hijacking of vital functions such as brakes, transmission, steering and windshield wipers. Some of the recalled vehicles were Jeep Cherokee 2014 and 2015, but several other vehicles were included in the recall as well, because the software glitch also impacted the 2015 Chrysler 200, the 2015 Chrysler 300, the 2015 Dodge Charger, the 2015 Dodge Challenger, the 2013-2014 SRT and Dodge Viper, the 2014-2015 Jeep Grand Cherokee (WK2), and the 2013-2015 Ram Truck 1500’through 5500. Chrysler published a patch that car owners could download and install via a USB stick. Having a car dealer installing the patch was also an option. 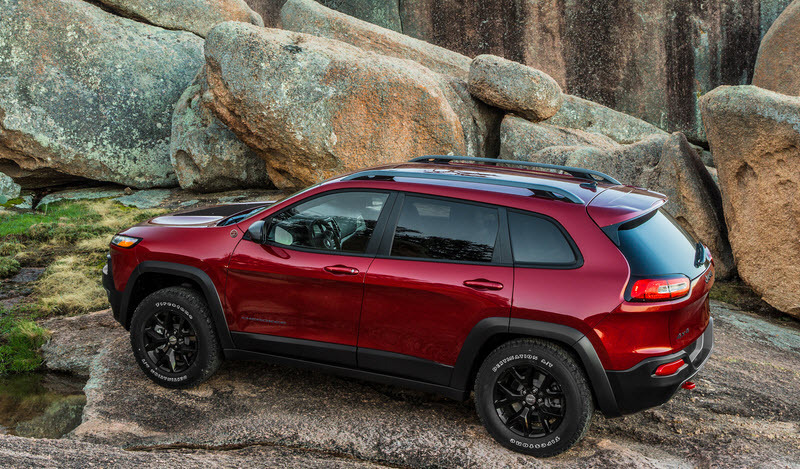 The 2019 Jeep Cherokee KL was unvealed at the North American International Auto Show in Detroit, USA in January 2018. The headlamps are larger than on the previous model year. To allow for this, the front grill has been moved down a tad. The headlamps have LED daytime running lamps (DRLs). The turn signals are integrated into the front headlamps. Fourth-generation U Connect 4 information system with HD Radio, Apple CarPlay, Android Auto. Engine choices include the 180-horsepower 2.4L Multi-Air Inline Four-Cylinder (I4) and the 271-horsepower 3.2L PentastarVVT V6. A new engine – the 270 hp 2.0L Hurricane Turbocharged Inline Four-Cylinder (I4) – is available on higher trim levels only. The transmission system is a ZF-manufactured 948TE 9-speed automatic transmission. The buyer can chose between Front Wheel Drive (FWD) and Four Wheel Drive (4WD).